Anaheim residents expressed their discontent at last week’s City Council meeting. Last Tuesday, Anaheim public television aired a program that was over 6 hours long and as dramatic in the Days of Our Lives sense as in the professional wrestling sense. It was like one of those dystopian movies that starts off intriguing, gets really frustrating, and eventually ends up getting so dark that it puts you in a funk for the next few days. No, it wasn’t Requiem for a Dream. Nor was it 1984 (though it did bear some resemblance). If you haven’t guessed it yet, the spectacle in question was none other than an Anaheim City Council meeting: where the day-to-day lives of citizens are subject to the political beliefs, personal vendettas, and private interests of seven city officials. This meeting in particular proved that members of the community who appear en masse to voice their concerns may quite literally be ignored. In attendance were members of a senior mobile home park who’ve been faced with an unexpected rent increase and residents of a neighborhood who are fighting against a high-density, high-income housing development that would further congest their already overcrowded streets. Public speakers from both of these groups passionately called for direct communication from council members. 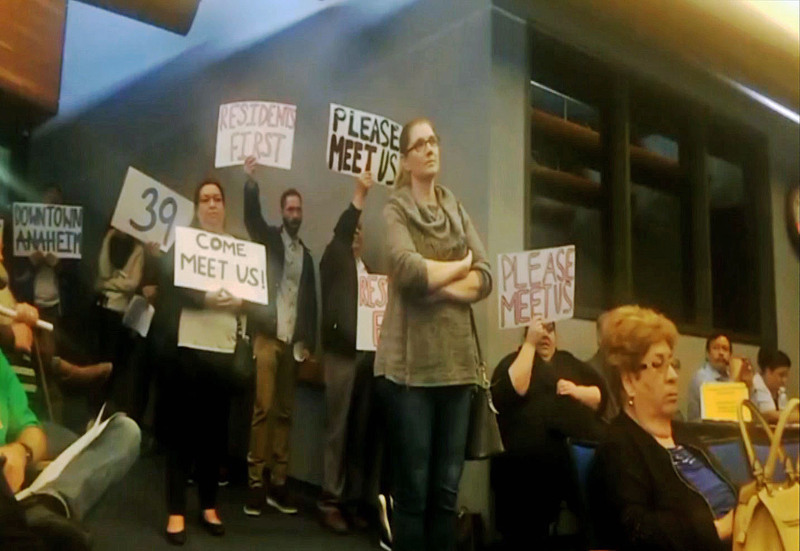 Members of the latter community held signs that read “Please Come Meet Us” and “Residents First” in response to Councilwoman Lucille Kring questioning the legitimacy of signatures on the petition they presented at last week’s public hearing about the development. At that same public hearing, representatives from this neighborhood were ordered by Mayor Harry Sidhu to cut their 10 minute presentation down to 2 minutes while the developer was given a virtually unlimited amount of time to push their case. As a result, the council voted to approve the development and this week’s meeting was the final opportunity for the community to dispute that decision. One speaker from the public voiced his discontent with that hearing. “This council majority seems to think that any developer has a God-given right to whatever modifications he might want for whatever fool[ish] project he dreams up,” he said. “This council majority seems to think of the regulations and zonings that exist to protect the quality of life of your voters and residents as just some inconvenience that can be shoved aside when some friend of yours sees a chance for profit.” Throughout the night, these feelings of despondency were ever-present. Some speakers admitted that they hadn’t even prepared a speech because they expected their allotted time to be cut short once again. However, community members remained resilient and proposed that the council postpone their final decision until they’ve had a chance to visit the neighborhood and speak to some of the residents themselves. “The ordinance is up again to be voted [on] a second time today. We’re not here to dispute. All we ask is that you listen to us,” explained Angelica Mejia, who lives in the neighborhood. “We’re not opposing housing in our neighborhood, we just want affordable housing. The developer said that he’s not here for affordable housing. We need housing in Anaheim, but we need affordable housing. Please meet with us,” she implored. Be that as it may, as Angelica Mejia pointed out, “The developer had 15 months to speak to you guys and plan this. We had very little notice.” Furthermore, the “process” that Barnes is referring to did not take into account the lives of the citizens who will be affected by this ordinance. The citizens of Anaheim have asked for government-imposed rent control. They’ve asked to have a say in the rezoning of their own neighborhoods. They’ve argued that a lack of affordable housing and unexpected raises in rent are two of the main contributors to Orange County’s ongoing homeless crisis. This is all Tom Taits fault. He refused to endorse a candidate for mayor in the last election, thus allowing the unamerican mayor from India being elected. The council did the same thing as Tait nothing. Whoa there. No need to be xenophobic. Harry Sidhu is as American as Curt Pringle! No one cares about anything or anyone except the almighty buck!! Anaheim Mayor and Councilman spoke to us at Rancho La Paz Mobile Home Park and said they would help us. I hope this development doesn’t change things or we seniors will be homeless. This is not right and unfair but people should remember that God is the one that gives a person the power over other groups of people based on his best interest In God we trust so dont think you will get very far or get away with any of thease unreasonable actions or decisions if your choices are in the best interests of people then quit assuming everyone is ignorant and wont listen take the time to explain and be humble. Wow, just comes to show how corrupt this land of the free is..
Has it ever been different in Orange county? Don’t get between a politician mother bear and her money Cubs cause they will attack. Can these politicians be traquilized and released in another area where they can do less damage? >>Rancho La Paz owner rescinds rent increases, works with residents to find path forward<>Is the city planning to regulate rents at the park? Housing affordability is a regular point of discussion in Anaheim. Intervening in people’s property and agreements between landlords and tenants is a big step for any government to take. Interesting to note that the Anaheim portion of the park is in District 3. So the Council Majority feels the proper way to approach this is to sit down and see if something can be worked out without government interference, while the Councilmember whose district the mobile park resides, Dr. Jose Moreno, feels the need to use government control to just not allow the rent increase. At the meeting, the owner disclosed that the main reason for the rent increase was the major hike in property taxes, to the tune of around $700,000 a year, which calculates to about $150 per month for each of the 400 spaces. If the rent moratorium took place, the owner, who purchased a property from an owner who basically took the approach of not running the property as a business, but as something the family had and opted to have the property not to make a profit, for unknown reasons. will lose money. When the previous owner decided to get rid off the property, the Proposition 13 rules kicked in. The Prop 13 rules that helped keep the rents low due to the fact that the tax increases were kept at 2% a year. And if Split Roll property taxes are approved in 2020, and businesses have to pay market rates in 2021, how will other Mobile Home Parks be affected. Or the small business that pays rent. The owner of that building will have to increase rents to cover the additional government costs. I am very pleased that the Mayor, along with Councilmembers O'Neil and Faessel helped facilitate a meeting where things got discussed from both sides, and that a workable solution can be found without mandates or other government interference.